Late Sat. 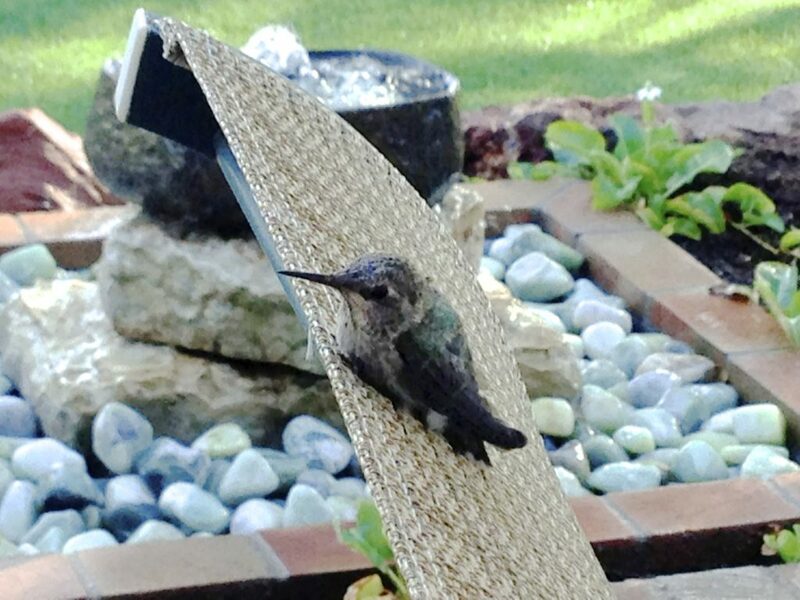 afternoon while wandering around my garden I found a baby hummer sitting in the sun on the brick patio. He looked stressed, didn’t fly away when I approached him and he was perfect cat bait! 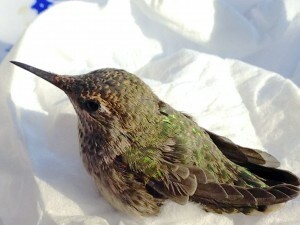 I immediately called for my husband, Rich, to begin the animal rescue. When it began to get dark I put a piece of facial tissue on top of the towel so his feet didn’t get tangled in the threads. I put the “nest” arrangement on a tray to make things safely portable. Then I covered him with a salad spinner basket. I decided to bring him inside for the night. I assumed he would be ready to fly off the next morning. Breakfast feeding began at 5 am and he did fly off a little way but landed on the ground and then didn’t try to fly again. I picked him up and walked him around the garden offering him a bush or shrub to climb onto but he stayed on my finger. So I brought him back to the tray and he asked for more food. I fed him throughout the day about every 15 minutes. He flapped his wings, and preened his feathers. He seemed quite content. He left tips of his contentment all around the tray, squirting out little sprays of poop. 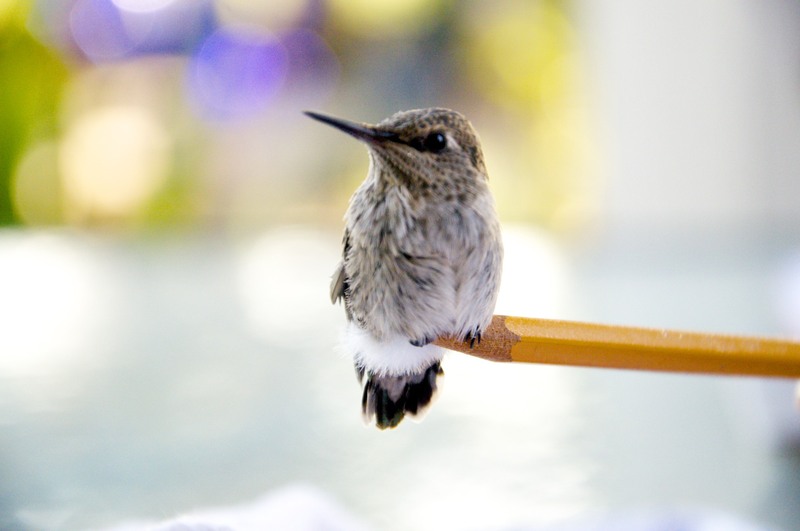 He climbed onto the pencil perch I offered him, I lifted it up and down and he flapped his wings, over and over. 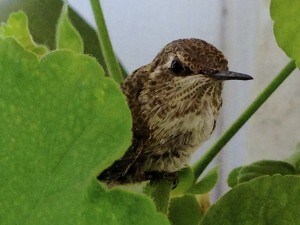 I thought surely he is ready to fly off but he just looked at me, “Are you my Momma?” So I offered him a perch in the geranium right outside the kitchen window. He was shaded, and hidden behind two big leaves. He spent most of the day there and still made no attempt to fly. It was Memorial Day, a three day weekend, so I assumed there was no one to call. 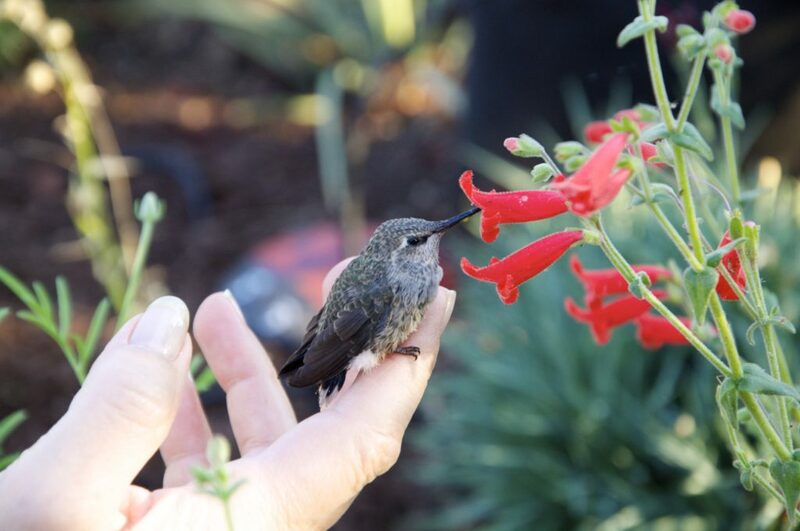 I walked him around the yard and offered him some penstemon flowers, he liked that and ate from the nectar they offered. He flew into the wet grass and stayed on the ground. So I returned him to the geranium. Tuesday morning I awoke worried! Would he become too weak as I had nothing to feed him than the sugar water? But he seemed fine, still opening his beak for breakfast. Since he still wanted to be fed with his mouth open like a baby bird and he wasn’t trying to fly away, I realized he was needing more mothering than I knew how to provide. 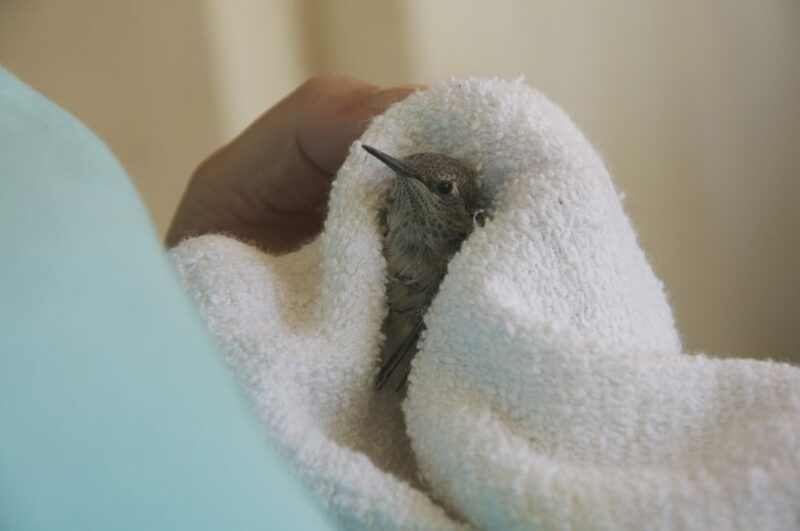 I searched for a wild bird rescue and within minutes I found a rehab site 20 minutes from home. I’m going to have a nice green coat! I drove the little guy over to Paul’s home. 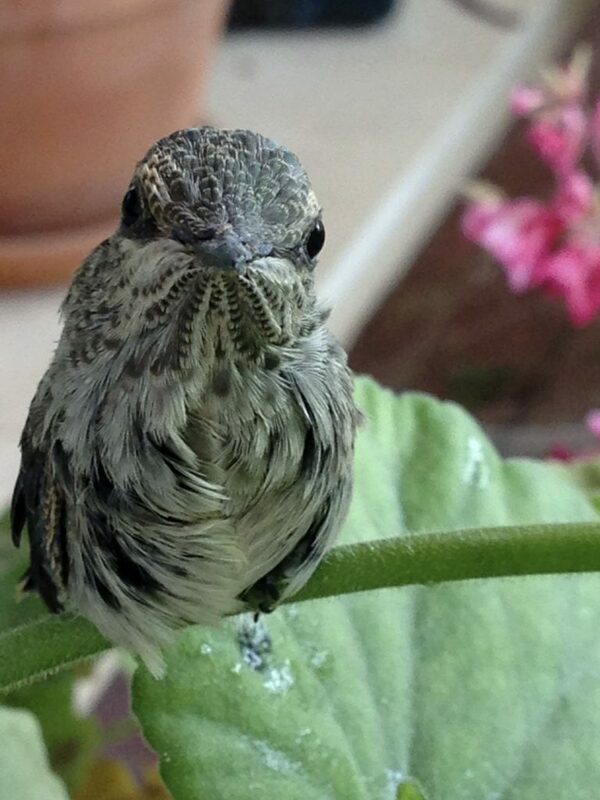 Paul has been doing bird rescue for 13 years, caring for about 800 birds each year. 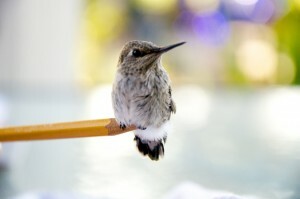 He currently had about 25 baby hummers under his care! He had super nectar food which contained enzymes and protein designed just for the little birds. He said my little bird was probably 3 weeks old. The babies when they leave the nest simply move into the tree around it. The parents continue to feed the babies for 6 weeks before they take off on their own. So Paul would feed this baby for that time. He provides a protected aviary for the birds to practice flying. When the bird matures sufficiently the rescued birds are released on the wildflower trail at the Desert Botanical Gardens. A happy ending, and simply a thrill to be able to experience a hummingbird so intimately. And what a wonderful discovery to learn about wild bird rescue volunteers! 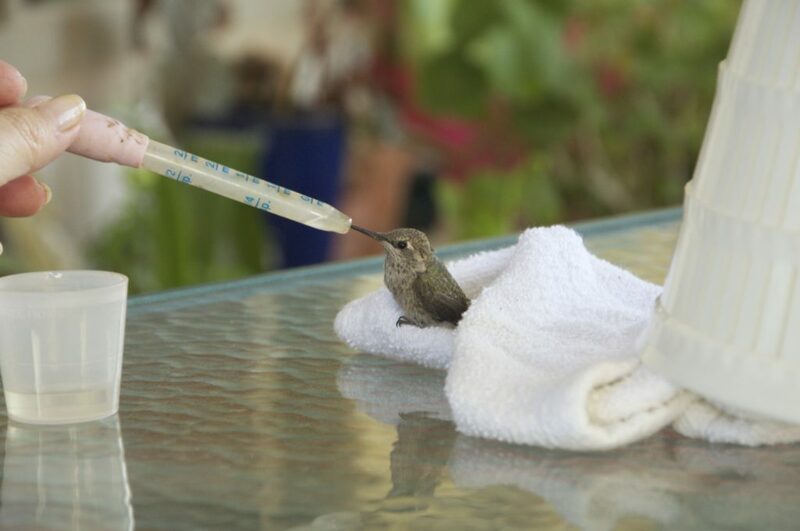 The commitment to nurse birds back to health, feeding, providing shelter, observing 7 days a week, 24 hours a day! Just to answer the phone when someone like me calls! I so wanted this to end well and the wildlife rescue volunteers made that happen. A wonderful story and great pictures! 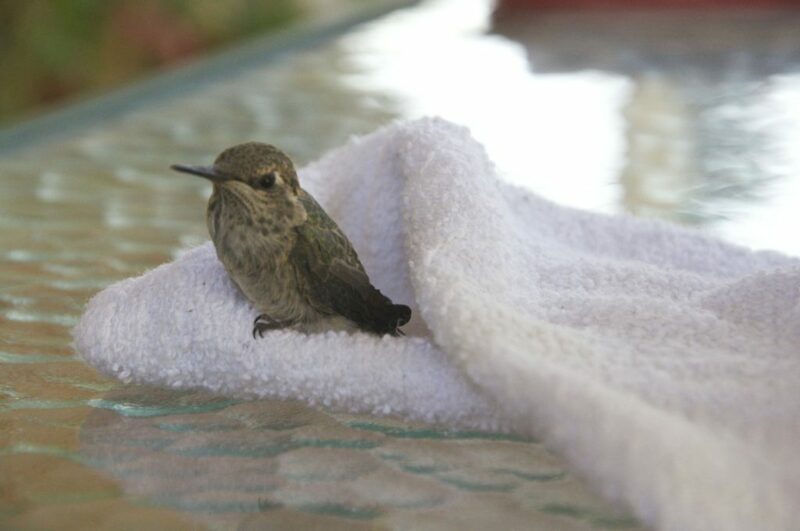 I also rescued a bird this week, He/she was hoping around the pool deck while momma bird was feeding him/her and it hoped right into the pool. Fortunately I saw it go in an rescued it. Momma then took over again. 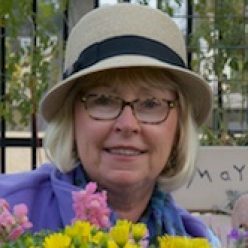 This is a lovely story — a book just waiting to happen! 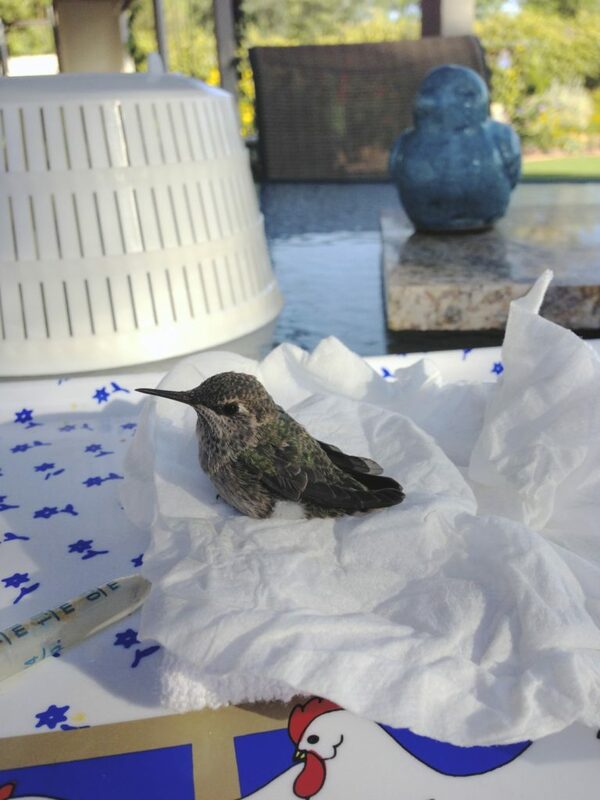 That was one lucky little hummer to land with the Larsons!